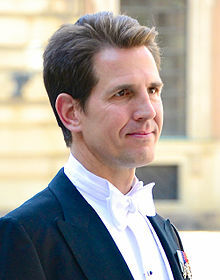 Pavlos, Crown Prince of Greece, RE (Greek: Παύλος; born 20 May 1967) is the eldest son and second child of Constantine II, the last King of Greece from 1964 to 1973 and his wife, Anne-Marie of Denmark. Pavlos was heir apparent to the throne of Greece and was its crown prince from birth, remaining so during his father's reign until the monarchy's abolition. As a male-line descendant of Christian IX of Denmark, he is also a Danish prince. Pavlos was born on 20 May 1967 at Tatoi Palace in Athens, to King Constantine II and Queen Anne Marie. His mother is the youngest sister of Queen Margrethe II of Denmark and his father is a brother of Queen Sophia of Spain. His maternal grandparents were King Frederick IX of Denmark and his wife Princess Ingrid of Sweden. He displaced his older sister, Alexia, born in 1965, as heir to the throne, Greece's order of succession adhering to male-preference primogeniture. Pavlos was born into a turbulent era in Greek politics. His father, King Constantine II, ascended to the throne on 6 March 1964, aged 23, following the death of his father, King Paul. His mother, the 20 year-old Queen Anne-Marie, gave birth to Pavlos barely a month after the coup d'état which ended democratic rule in Greece over the King's objections on 21 April 1967, ushering in the "Regime of the Colonels", led by Georgios Papadopoulos. In December of that year, King Constantine attempted a counter-coup, but could not rally sufficient military support. Pursued by supporters of the junta, the King fled with his wife, children, mother and sister to Rome. From Rome they went to Copenhagen, and lived with Queen Anne-Marie's mother, Queen Ingrid. 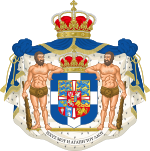 During the years 1967–1973, Greece remained officially a monarchy, with a regency appointed while the King lived in exile. On 1 June 1973, Constantine II was declared deposed and Georgios Papadopoulos became the self-appointed President of Greece. On 17 November 1974, the Greek legislative election, 1974 was held, resulting in a victory for Constantine Karamanlis and his New Democracy party. Less than a month later, on 8 December, the Greek plebiscite of 1974 confirmed a referendum of the previous year: the majority of Greek voters preferred a republican constitution (69%) to restoration of the monarchy (31%). Constantine II accepted that his reign was at an end. He and Anne Marie had been living with their family in London for several years. Pavlos' youngest siblings were born in London, Theodora in 1983 and Philippos in 1986. Pavlos was educated in London at the Hellenic College of London, founded by his parents. He attended the Armand Hammer United World College of the American West, Montezuma, New Mexico, USA, from 1984 to 1986. After training at the British Army's Royal Military Academy Sandhurst, he was commissioned a second lieutenant in the Royal Scots Dragoon Guards in 1987 on a three-year short service commission. He was promoted to lieutenant in April 1989, and relinquished his commission in April 1990. In 1993 he completed his BA at Georgetown University School of Foreign Service and later while sharing a house in Washington, DC he and his cousin, Felipe VI of Spain, then Prince of Asturias, attended Georgetown University where each obtained a Master of Science in Foreign Service in 1995. As an adult he has lived in New York City and London, working as an investment consultant. He is an experienced bluewater yachtsman and crews on the multi-record-breaking monohull Mari-Cha IV owned by businessman and father-in-law, Robert W. Miller. Pavlos married British-born heiress Marie-Chantal Miller, whom he had met at a party three years earlier in New Orleans, on 1 July 1995. The Greek Orthodox rite wedding at St Sophia's Cathedral, London drew a rare modern panoply of royalty, but the ceremony proved to be legally invalid and had eventually to be repeated civilly (not normally required in the UK) in Chelsea because of an obscure law requiring that marriages in England be conducted in English. After their marriage, the couple took up residence in Greenwich, Connecticut, the job that Pavlos obtained with the Charles R. Weber ship-broking company being headquartered there. Later, he went to work at a New York City firm as an investment portfolio manager, before relocation to London for their children's education in 2004. The couple have five children: Maria-Olympia (b. 1996), Constantine-Alexios (b. 1998), Achileas-Andreas (b. 2000), Prince Odysseas-Kimon (b. 2004), and Prince Aristidis-Stavros (b. 2008). From birth, Pavlos was the heir apparent to the throne of Greece and as such he was referred to as the Crown Prince of Greece with the style of Royal Highness. Following the deposition of the Greek monarchy in 1973, these titles and styles are no longer legally recognised by the government of the Hellenic Republic. Through his male-line descent from Christian IX of Denmark, he is also a Danish prince with the style of Highness. Pavlos was a direct descendant of three reigning sovereign monarchs at birth. He was the eldest son of the King of Greece, grandson of the King of Denmark and great-grandson of the King of Sweden, all living and enthroned when he was born. His paternal aunt, Queen Sofía of Spain, was Queen Consort of Spain. His maternal aunt, Margrethe II of Denmark, is the reigning Queen of Denmark. By male-line descent, he is a member of the Schleswig-Holstein-Sonderburg-Glücksburg branch of the House of Oldenburg. Pavlos is a scion multiple times of the "Grandparents of Europe", due to royal intermarriage. As a result, he descends from Christian IX of Denmark through three of his children; in the male line through George I of Greece, in the female line through Frederick VIII of Denmark and through King Christian's daughter Princess Thyra, Duchess of Cumberland. He also descends thrice from Queen Victoria: once through her third son Prince Arthur, Duke of Connaught and Strathearn, and twice through her eldest daughter Victoria, Princess Royal. ^ "Heir to Throne Is Born To Greek Royal Couple". The New York Times. Associated Press. 21 May 1967. Retrieved 3 May 2016. ^ Colacello, Bob. "Greece's Royal Couple". Retrieved 29 July 2016. ^ "No. 50965". The London Gazette (Supplement). 16 June 1987. p. 7683. ^ "No. 51696". The London Gazette (Supplement). 11 April 1989. p. 4291. ^ "No. 52119". The London Gazette. 24 April 1990. p. 8237. ^ Folketinget. Frank Jensen. 12 October 2001. Ministry of Justice: Spm. nr. S 3937. (Danish). Retrieved 5 April 2017. ^ Genealogisches Handbuch des Adels, Fürstliche Häuser XIX. "Danemark". C.A. Starke Verlag, 2011, p. 10. (German). ISBN 978-3-7980-0849-6. Hindley, Geoffrey (2000). The Royal Families of Europe. New York: Caroll & Graf. ISBN 0-7867-0828-X. Woodhouse, C.M. (1998). Modern Greece a Short History. London: Faber & Faber. ISBN 0-571-19794-9. Γιάννης Κάτρης (1974). Η γέννηση του νεοφασισμού στην Ελλάδα 1960–1970. Athens: Παπαζήση. Αλέξης Παπαχελάς (1997). Ο βιασμός της ελληνικής δημοκρατίας. Athens:Εστία. ISBN 960-05-0748-1. Generations are numbered by descent from George I. This page was last edited on 8 April 2019, at 16:59 (UTC).